CARACAS, Dec 2 2009 (IPS) - The red lionfish (Pterois volitans), a venomous coral reef fish from the Indian and western Pacific Oceans, has invaded the waters of the Caribbean and the Gulf of Mexico, threatening to wreak havoc on ecosystems, native fish populations and popular underwater diving areas. The invasive, exotic-looking fish apparently reached the Caribbean in 1992 when Hurricane Andrew destroyed an aquarium in a restaurant in Florida and six of the ferocious predators got out. “The lionfish is a beautiful, colourful fish that reaches 45 cm in length, with bold reddish or maroon and white stripes and long, showy pectoral and dorsal fins with dangerous venomous spikes,” biologist Juan Posada, head of the organism biology department at the Simon Bolivar University in Caracas, told IPS. The lionfish was found in the waters around the Bahamas in 2004, near Cuba and the Turks and Caicos Islands in 2007, in Haiti, the Dominican Republic, Puerto Rico, Belize and the Colombian island of San Andrés in 2008, and off the coasts of Mexico, Honduras, Costa Rica and Panama this year. It most recently turned up in the waters off the Dutch islands of Aruba and Bonaire in September and October, near Venezuela’s northwest coast. “It may also have reached this area in the ballast waters of a merchant ship, but that is less likely. The lionfish populations probably descended from the specimens that escaped from the aquarium, and have flourished thanks to their specific characteristics and the fact that in the Atlantic Ocean they don’t have natural predators, like the big fish in the Pacific,” said Posada. But it can live as deep as 175 metres below the surface, and even young lionfish are protected from other predators by their long, poisonous spines. And as a voracious predator – it eats smaller fish, crabs, shrimp and even young lobster – it poses a serious threat to local fisheries. They are also prolific breeders, said the expert. A single female can lay up to one million eggs in her lifetime, and because of the warm climate in the Caribbean, they can spawn year-round, giving them a better chance at survival. The fertilised eggs and newly hatched larvae then drift in the ocean currents, which carry them farther and farther away, fuelling the lionfish population explosion and expansion. “Based on experience, it is practically impossible to eradicate a successful introduced species; they are here to stay, and we have to learn to live with the problem and try to manage it,” said Posada. 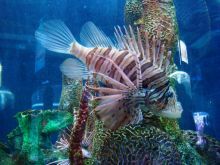 Another challenge in fighting the spread of the invasive lionfish population is the venom – mainly consisting of a protein toxin – located in glands at the base of each dorsal spine. Although the venom is rarely fatal to humans, the sting is extremely painful, causing vomiting, dizziness, breathing difficulties, headaches, “and sometimes arrhythmias (irregular heartbeats), and the effects can last for hours, or even days,” said Posada. Treatment for a lionfish sting includes immediate immersion in non-scalding hot water for 30 minutes, because the proteins in the venom are broken down by heat, which prevents them from spreading in the bloodstream. In addition, any broken spines should be removed from the wound, and the victim can be given a painkiller, said the expert. “The same principle of denaturing the venom operates in the case of someone who catches a fish and wants to eat it, because lionfish are edible, the meat is tasty,” said Posada. Lasso pointed to the destruction caused by exotic species that are transported in the ballast tanks that allow ships to remain stable despite changes in the amount of cargo that they are carrying. Once the ships unload their cargo, they fill up their tanks with water from the destination point – water that contains billions of organisms, including eggs and larvae from a broad range of sea species. When cargo is loaded, the ballast water is discharged, sometimes halfway across the globe. That is how, for example, the muzzled blenny (Omobranchus punctatus) was apparently brought to Trinidad in the 19th century on ships from India. The fish has been found in the Gulf of Paria, which separates that Caribbean island from Venezuela, and it competes for habitat with native species – although not with the voracity of the lionfish – from Mexico to Brazil. Ichthyologists – zoologists who study fish – are trying to raise awareness among fisherpeople, divers, authorities, sailors, coastal communities and the public in general on the risks of introducing exotic species. The tilapia (Oreochromis mossambicus), native to Africa, is a well-known problematic invasive species, in Venezuela and many other countries. It is on the International Union for Conservation of Nature’s (IUCN) list of the 100 World’s Worst Alien Invasive Species. Just 12 years after some 800 tilapia were introduced in the Laguna de los Patos, a small lake in northeastern Venezuela, in 1964, only 10 of the 23 native species of fish were left. The researchers who spoke to IPS underscored the serious harm to native ecosystems that can be caused by releasing non-native pet fish or farmed fish – like tilapia – into the wild, as demonstrated by the lionfish, which according to some experts has the potential to become one of the most catastrophic marine invasions in history.